Are you tired of dark circles and puffiness under your eyes? It`s time to put these problems into the past! OUR NEW RETINOL UNDER EYE GEL WAS CREATED ESPECIALLY FOR YOU TO RETURN YOUR FRESH AND YOUNG LOOK EASILY AND QUICKLY! This gel will become a pleasant finding for you! Once applied on the skin, it absorbs lightning fast and leaves no greasy or sticky marks. 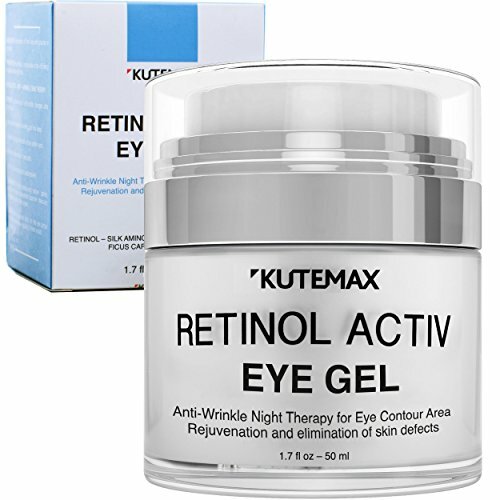 The composition of retinol under eye gel was carefully elaborated with the aim to take gentle and harmless care of your skin. All ingredients are organic and extremely effective in dealing with dark circles, puffiness and all types of fine lines. As well as having an anti-age effect, our under eye gel is a powerful moisturizer, which will saturate your skin with all necessary nutrients and make it young and fresh-looking. Say "YES" to attractiveness and youth of your skin! Say "YES" to our new retinol eye gel! CLICK ADD TO CART AND BUY NOW! If you have any questions about this product by Kutemax, contact us by completing and submitting the form below. If you are looking for a specif part number, please include it with your message.